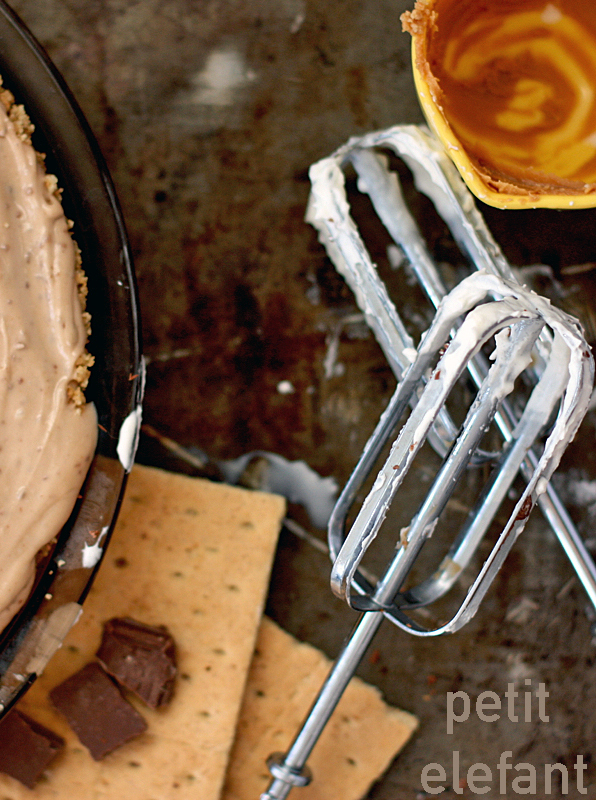 Chocolate Peanut Butter Pie: are there 4 more beautiful words in the English language? I think not. 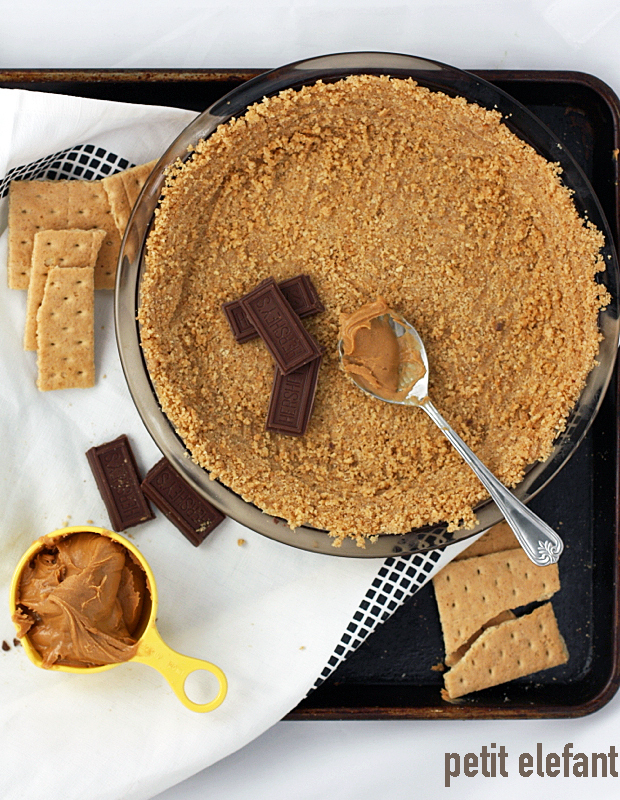 I’d just be happy with a chocolate pie normally, but when you add peanut butter my brain explodes. In a happy way. In the best way possible. So imagine then, if you will, what happens to my brain when you take chocolate, peanut butter, and add some cream cheese to the mix. My-body-is-no-longer-a-wonderland, is what is happening. A few years ago (probably more like 13 or 14) my husband’s best friend was in college in a town next door to the one my husband and I were living in as somewhat-newlyweds with our brand new baby girl. The friend, we’ll call him Elko, used to come over to borrow kitchen supplies for random things, and pretty soon he borrowed a rolling pin, for an extended period of time. What does a young twenty-something college guy need with a rolling pin? Well, it turns out he was having weekly pie nights with roommates, friends, and family. Everyone gathered together once a week at Elko’s apartment with ingredients, pie tins, and utensils for their own pies; they all hung out, made pies, and generally had a good time of it. I never made it to a pie night, but as a benefactor of a rolling pin for the betterment of others, once in a while I’d get a slice of pie out of the deal. Not too long after this tradition started, my husband’s best friend’s sister moved into town. (My brother’s best friend’s girlfriend’s mom’s sister saw him at 31 Flavors last night. Name that movie). Her name was Alma (still is) and she made a mean pie. 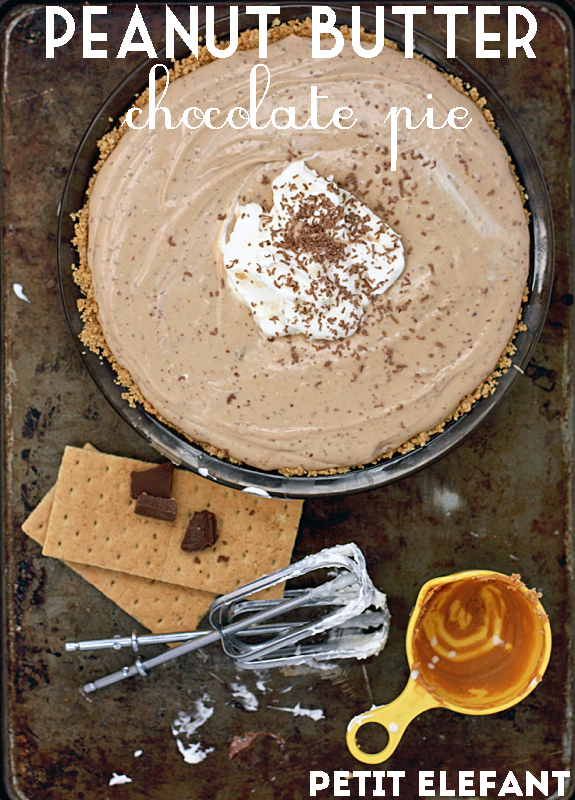 I don’t remember exactly how I got this peanut butter chocolate pie recipe from Alma, I think it came from her aunt Mary Moo (not her real name) but all that really matters is that I hounded Alma until I had this recipe in my collection, and you’re about to, so we’re all winners here. 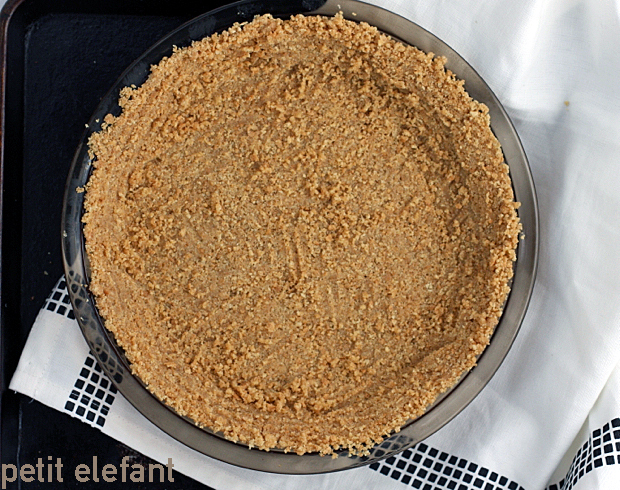 Before you start on the pie you need to make a graham cracker crust. If you aren’t a fan of graham crackers, or you just like regular ol’ pie crust, use this recipe for the best pie crust you’ve ever made. You won’t regret it. 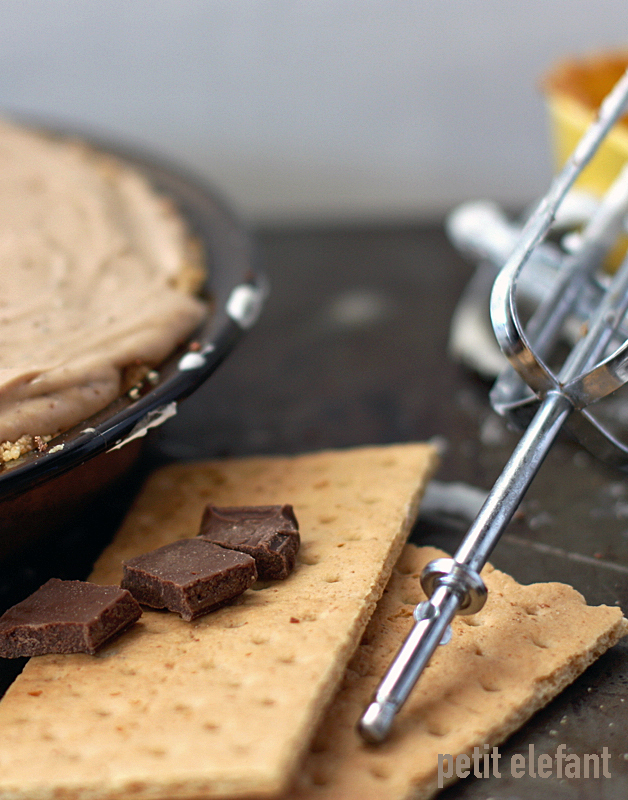 But if you want to do a graham cracker crust (you totally do) now’s the time to make one. This pie crust is seriously the easiest. Take a package of graham crackers and put them in a large gallon Ziploc bag. Squeeze all the air out of the bag. With a rolling pin roll across the Ziploc bag until the graham crackers are totally crushed into crumbs. In a bowl, or the pie tin itself, dump the crackers and add the melted butter. Add as much butter as you’d like, and mix it all up until the crumbs are sticky and mold-able. 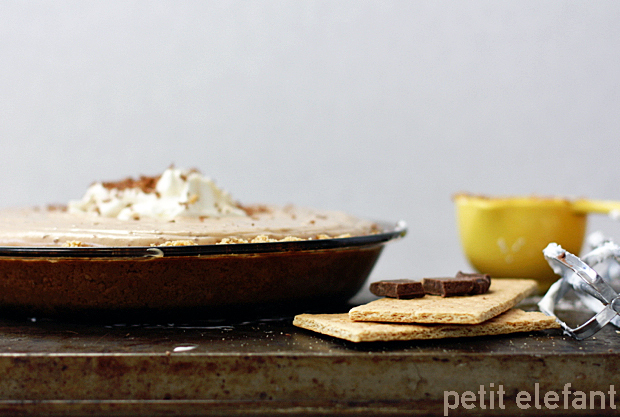 Use a fork to press the graham crackers into the bottom and sides of the pie tin. Now’s the time to assemble the actual pie ingredients. 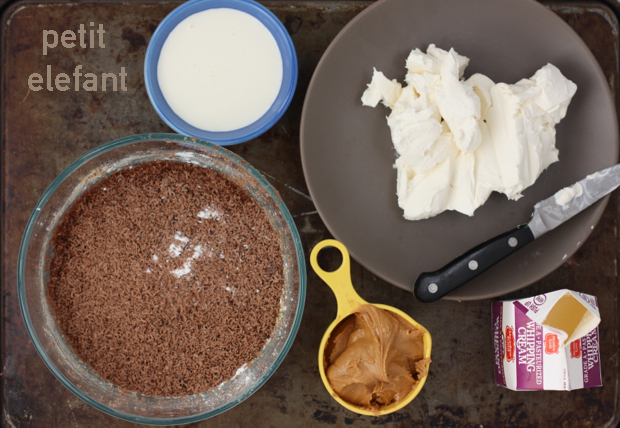 Mix the peanut butter, powdered sugar + milk in a bowl until combined. 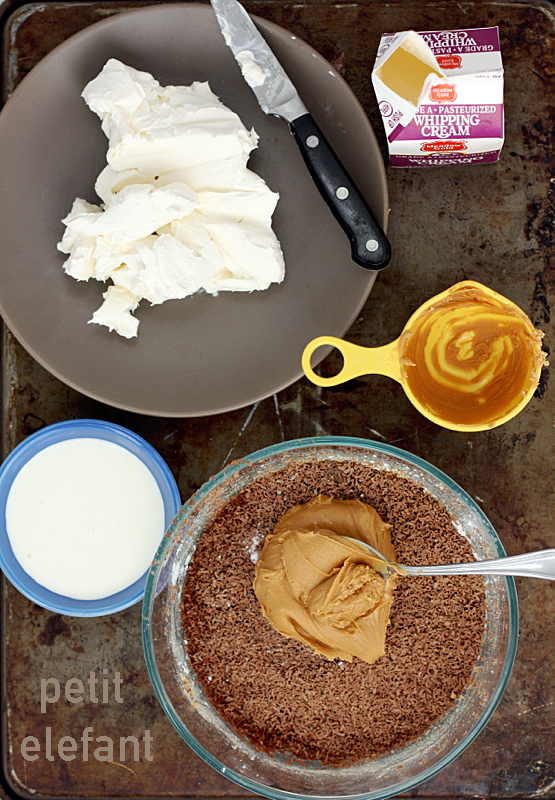 Then add cream, cream cheese + chocolate. Mix until everything is nice and smooth. Spoon into crust (it should be nice and thick), and refrigerate for 2 hours or overnight. When you’re ready to serve the pie, and blow minds everywhere, add a dollop of whipped cream + grated chocolate garnish to the top for gorgeous presentation. Serve cold. I am totally not responsible for the diet-blowing, moaning-and-groaning, thigh fattening results. I will, however, condone the mixing of peanut butter + chocolate, every time. This looks SO delish, but I’m confused about the whipped cream. I see a small carton of whipping cream here…does it turn into 2 cups once whipped? or do you just use it in it’s liquid form? 2 cups of the liquid? Thanks!